Annuals; scapose or subscapose. Stems (simple or few from, or distal to, base), unbranched, (0.1-)0.3-1.2 (-1.6) dm, sparsely to densely pubescent proximally, trichomes 2 (or 3)-rayed, 0.1-0.6 mm, sometimes with simple or spurred ones, to 0.9 mm, distally usually glabrous, rarely with few trichomes. Basal leaves not rosulate; petiole obscure; blade elliptic or spatulate to obovate or suborbicular, 0.5-2.3(-3) cm × 1.5-8(-13) mm, margins entire, surfaces pubescent abaxially with stalked, 2-4-rayed trichomes, 0.1-0.5 mm, adaxially with simple trichomes, 0.6-1 mm, with stalked, 2-rayed ones, to 0.7 mm. 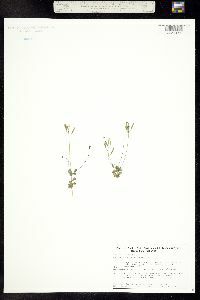 Cauline leaves usually 0, rarely 1-3; sessile; blade similar to basal. Racemes (3-)5-12(-16)-flowered, ebracteate, (subumbellate), not elongated in fruit; rachis not flexuous, usually glabrous, rarely sparsely pubescent. Fruiting pedicels horizontal to divaricate-ascending, straight, (1-)2-7(-9) mm, glabrous or glabrate. Flowers: (late-season ones cleistogamous, apetalous); sepals oblong, 1.5-2.3 mm, pubescent, (trichomes simple); petals (rarely absent), white, spatulate, 2-4.5 × 1-1.5 mm; anthers ovate, 0.4-0.5 mm. Fruits linear to linear-oblong, plane, flattened, (5-)7-16(-20) × 1.2-2.3 mm; valves glabrous or pubescent, trichomes usually simple and antrorse, 0.1-0.3 mm, rarely with fewer, spurred or 2-rayed ones; ovules 32-88 per ovary; style 0.02-0.1 mm. Seeds oblong to ovoid, 0.5-0.8 × 0.3-0.5 mm. 2n = 16, 30, 32. Flowering Feb-Jun(-Aug). Rock outcrops, dry slopes and hillsides, prairies, glades, roadsides, disturbed sites; 0-3000 m; Alta., B.C., Man., Ont., Sask. ; Ala., Ariz., Ark., Calif., Colo., Ga., Idaho, Ill., Iowa, Kans., Mass., Mich., Minn., Mo., Mont., Nebr., N.Mex., N.Y., N.C., N.Dak., Ohio, Okla., Oreg., Pa., S.C., S.Dak., Tenn., Tex., Utah, Wash., Wis., Wyo. Draba reptans is often confused with D. cuneifolia, but the two are easily separated. The rachises and pedicels of D. reptans are usually glabrous (rarely with a few isolated trichomes); those of D. cuneifolia are always densely pubescent. Interestingly, both species show parallel variations in chromosome number; it is currently unclear whether this variation is real or the result of misidentified specimens and/or erroneous counts. 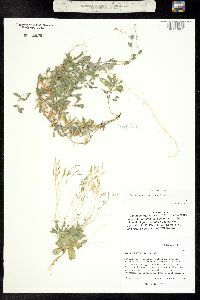 Annual herb with a branched taproot 5 - 20 cm tall Stem: single or multiple from base, upright, branched, purplish below, hairy, becoming hairless towards top. 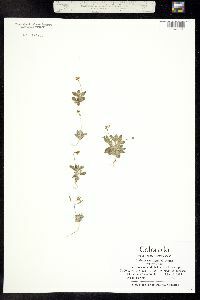 Leaves: mostly basal (with a few stem leaves near the base), alternate, 1 - 3 cm long, reverse lance-shaped to spatula-shaped or reverse egg-shaped, bases tapering, tips rounded, covered with stalked, star-shaped hairs. Flowers: in a dense, branched cluster (raceme), which is borne terminally on the stem. The raceme axis is 5 mm - 2 cm long. Sepals four, upright, green, oblong-elliptic. Petals four or none, white, to 5 mm long, tips rounded or slightly notched, bases narrowed. Stamens six. Fruit: an elongated pod (silicle), upright or ascending, 1 - 2 cm long, 2 - 3 mm wide, flattened, linear, sometimes minutely hairy. The fruit stalk mostly a third to half as long as the pod. Similar species: Both Draba brachycarpa and D. verna are similar but have leaves throughout the plant (D. brachycarpa) or confined to the basal area (D. verna). The flowers of D. verna are deeply cleft, and the silicles of D. brachycarpa are less than 5 mm long and 1.3 mm wide. 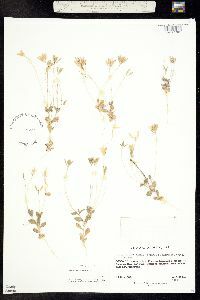 Habitat and ecology: A common plant found in several habitats in the Chicago Region, including sand barrens, dolomite glades, gravelly hill prairies, and disturbed roadsides (especially where limestone is at or near the surface). Etymology: Draba comes from the Greek word drabe (which was also once a Greek word for a cress plant), meaning sharp or acrid, which refers to the burning taste of the leaves. 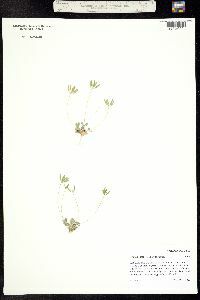 Reptans means creeping. Generally found in very dry, sandy soil in woodland pastures, fallow fields, and waste places, along roadsides, and on open, wooded dunes. 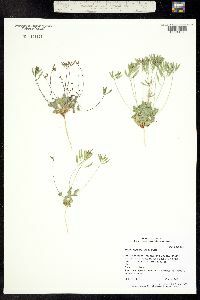 The variety has been reported from the dune area. Although I have not seen a specimen, it should be sought in the state. Duration: Annual Nativity: Native Lifeform: Forb/Herb General: Small, herbaceous annual with a single or occasionally multiple unbranched stems growing from a cluster of basal leaves. Leaves: Mostly basal, 1-5, ovate to oblanceolate, covered with long, stiff hairs, leaf surface evident and appearing smooth and shiny beneath the hairs, hairs stellate or forked at the tips. Flowers: Showy, white, borne in terminal clusters, bisexual with 4 free sepals, petals to 5 mm, often absent in lateral inflorescences, 4 long and 2 short stamens, 1 superior ovary. Inflorescence and pedicels glabrous. Fruits: Linear, flattened, laterally dehiscent capsule, 7-16 mm, glabrous to pubescent, occasionally with antrorse (tending upwards) trichomes. Ecology: Found on dry soils in disturbed areas, hillsides, roadsides, prairies, and glades, from 0-10,000 ft (0-3048 m); flowers February-August. Notes: Look for the showy white flowers combined with the elongated capsules to identify this mustard. Ethnobotany: Crushed leaves applied to sores. Synonyms: Numerous, see Tropicos Editor: LCrumbacher, 2011 Etymology: Draba derives from the Greek drabe for "sharp" or "acrid" and referring to the burning taste of the leaves which supposedly had a medicinal value as a poultice, while reptans means having creeping and rooting stems.